Hello, my name is Derek Motion. I am the Executive Officer at Western Riverina Arts (WRA) servicing Narrandera, Leeton, Griffith and Murrumbidgee. WRA is still relatively young, but already beginning to build a history and reputation in the region. 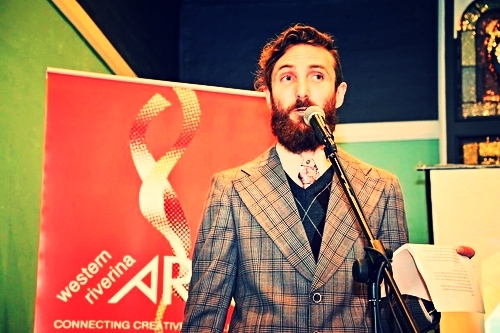 We are dedicated to support the development and promotion of all arts in our region and aim to ensure the vitality and sustainability of the Riverina’s rich and diverse culture by offering a helping hand for artists, promoting cultural events and connecting creative communities. I hope this website inspires you to explore the fantastic art work, artists and creative communities we have in the Western Riverina. Feel free to browse, leave comments or follow WRA on social media and please do not hesitate to contact us and find out what we can do for you and the arts in our region.